Remember, this is an imaginary scenario half-way through election night. Here's the graph for the current polling situation, as per electoral-vote.com. Just calibrating my posts - here's a poll about my last post - if you haven't seen it yet, wait 'till you've stopped reading your friends list before you come back. I promise this poll has no wrong answers. Update: I am overjoyed to learn that as of just now, no less than 14 people have some idea what I'm on about. That last chart is the most complex I've produced, I wasn't sure how to explain what it was and I was pretty sure I hadn't done a good job of it, so that even one other person gets it is really nice. All ideas on how to set out the meaning of that chart welcome. Sorry to use the FIPS state codes, but I think the gain in clarity is worth it. Putting that into the Electoral College, we get a narrow win for Clinton or a less narrow loss for Obama. This reflects what the markets are saying: Betfair give Clinton a 73% chance of taking the Presidency, but Obama only a 55% chance. I had wondered why the Democratic party hadn't just given up and joined the Obama train; it turns out the answer is Florida, Ohio, New Jersey, Pennsylvania and Missouri. As I mentioned last time, SurveyUSA say that their poll shows the Democrats taking the White House whether Clinton or Obama is the nominee. However, in both cases it's a rather nail-biting victory. To illustrate that, we draw the states ordered by the margin of difference between the candidates. 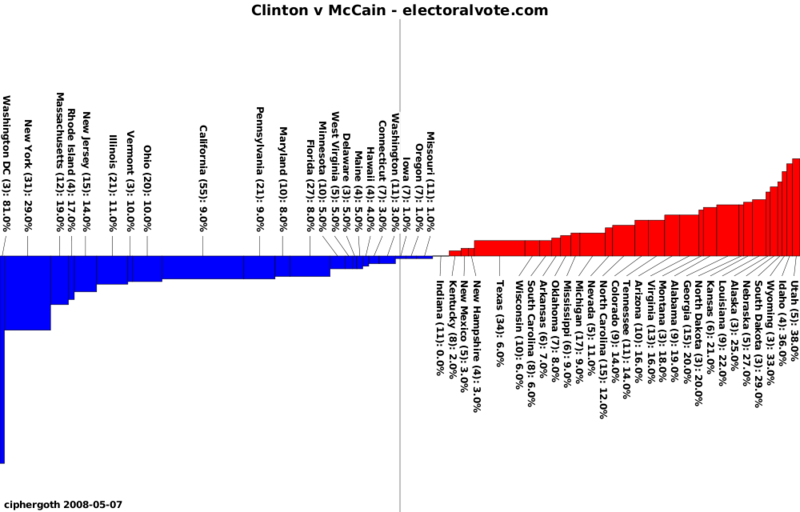 The width of the bar indicates the number of electoral college votes, and the line across the middle is the half-way mark. Whichever candidate takes the state indicated by the middle line wins the election. Here's what the 2004 election looks like - it should be clear for example that if Ohio had gone the other way, then New Mexico and Iowa wouldn't have been enough to grant the Republicans victory. 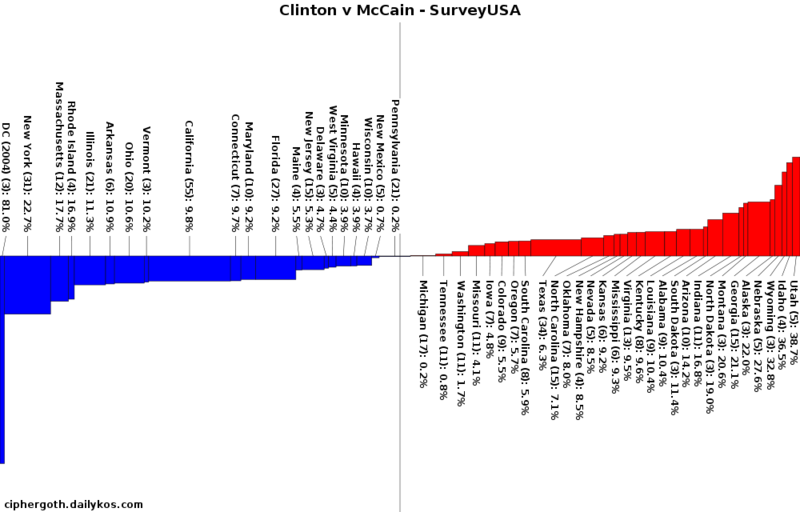 Incidentally, I've used the 2004 data to fill in DC's vote, since SurveyUSA didn't poll it. Clinton wins the election according to this poll, because she wins Pennsylvania; however, she wins it by a 1%. Flip Pennsylvania the other way - or any state with eight or more electoral votes - and the election goes the other way. For Obama things are even scarier. 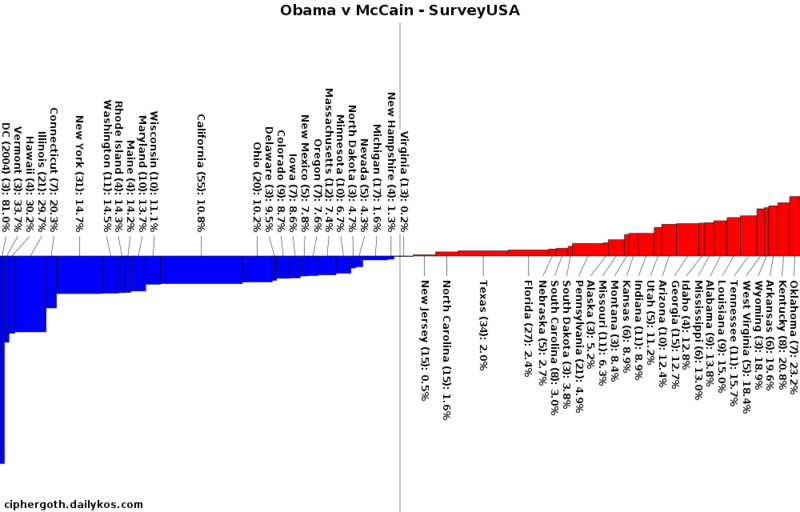 You can see that he lifts the Democratic vote overall - the blue area is thicker overall and the red thinner - but both Virginia and New Jersey are shown as tied with McCain, and Obama needs one of them to win. If either goes Blue then Obama is in, but if the Republicans can keep Virginia and take New Jersey they get another four years. Unless Obama can take Texas from them, in which case its 34 electoral votes will give the Democrats a huge victory even if they lose some smaller states like New Hampshire along the way. 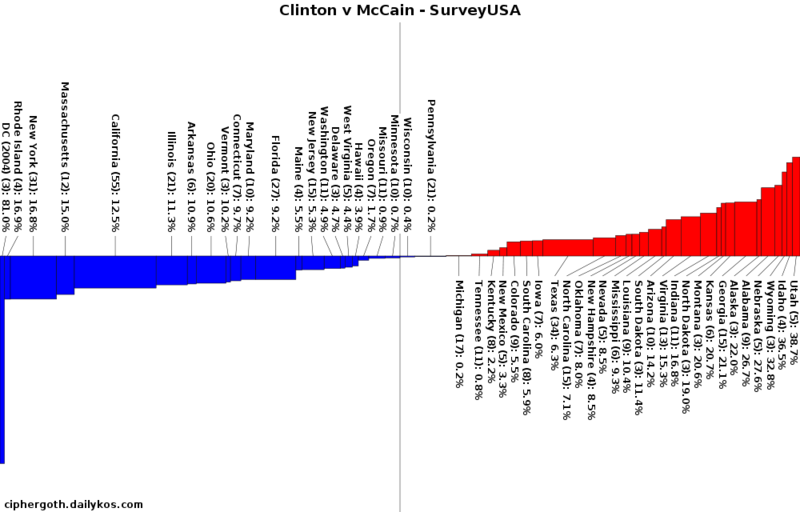 SurveyUSA have been polling to see how Obama and Clinton might do against McCain if the election was today. 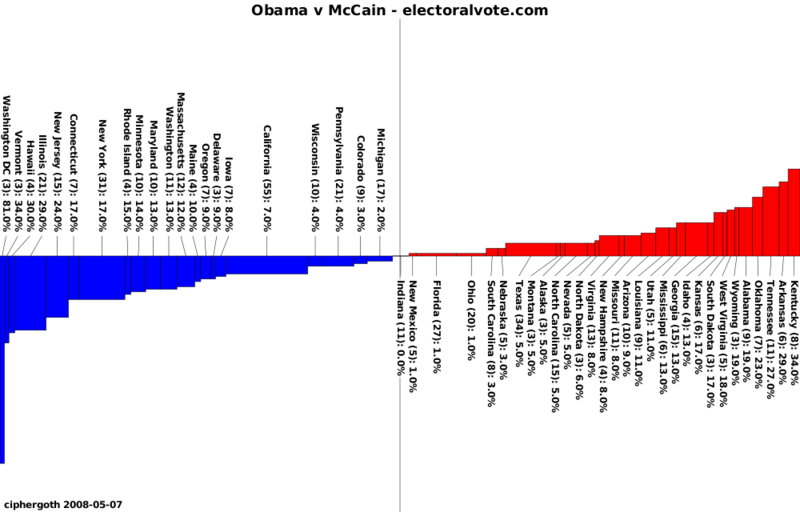 Their polls predict that either would win in the electoral college, but Obama's win is by a higher margin. 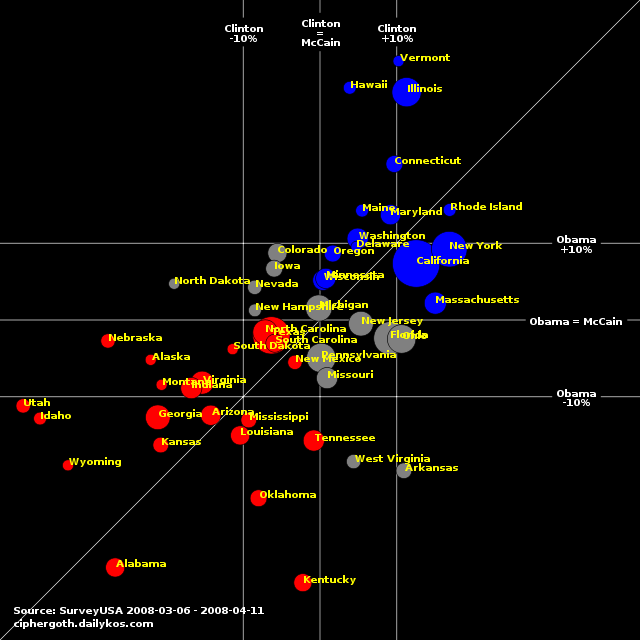 The chart above plots their relative state-by-state performance according to the poll. Blue states both of them win, red states neither of them win, gray states one wins and the other loses. 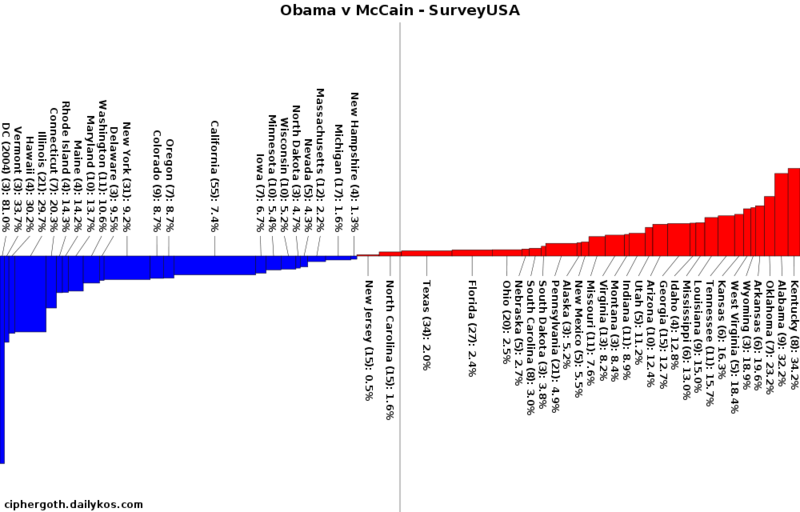 Obama does better in the states above and to the left of the diagonal, while Clinton does better in those down and to the right. The lines flanking the center lines show where the margin of preference exceeds 10%. DC was not surveyed and is not shown; no Democrat could lose DC. The area of the circle is proportional to the number of electoral votes that state has to give. I'm amazed at the huge disparity in their performance in some states. Arkansas, West Virginia and Tennessee are all wins for Clinton, but Obama loses them all by over 15 points, while at the other end of the scale North Dakota is a win for Obama but a 19 point loss for Clinton, and Washington state is a loss for Clinton but a 14 point win for Obama. Another diagram showing the fortunes of the Lib Dems - I had another go to see if I could show more of what's going on. The position on the diagram indicates the proportion of votes cast; the colour of the circle indicates composition of the resulting parliament. The hollow circles indicate hung parliaments, and the ones with white dots indicate a 3/5ths majority. The white triangle indicates the region where no party has a majority of the votes, with the subdivisions showing which has plurality, so the point where the three lines meet is the point at which all three have equally many votes. Updated to use labels Three points on the diagram are labelled; one marks the results of the 2005 general election from which the entire diagram was extrapolated, and two of them mark results from recent polling data and what sort of Commons this model predicts from that data. The means of extrapolation is pretty ropey - I'd be interested to know where to look to find better ones. This is of course a work in progress. After watching far, far too much West Wing (ie all of it - finally reached the end which is both bad and good) I created this image to visualize the results of the 2004 election. I want something like this updated live for 2008, with states not yet called ranked based on predictions. You'll need to view it full size to properly see what's going on. Please spread the word, and let me know what you think! I re-wrote the election toy in Java so you could all use it from your browsers. You'll need the latest Java plugin, especially if you're using IE. Update: now with lots of extra pretty! The dots start in their positions for one election, and move smoothly into the positions they occupy at the subsequent one. You can see, for example, Tory gains; they're the non-blue dots in the blue area. And if you hover over a dot, it tells you what constituency it is.